Deep into the 4th set of a Saturday slugfest with defending conference champions Greenville, Principia’s junior captain Sophia Hathaway muttered the game changing words to herself as Allyson Mitchell went back to serve with her Panthers leading the set 19-13 and the game two sets to one. Having already played 4 hours of volleyball at this point in the day and with their backs to the wall against one of the best D3 teams in the nation, it appeared as though Principia had given everything and was set to come up short. Maybe it just wasn’t meant to be today. At this point, watching from behind the baseline with notepad in hand and heart pounding, I began wondering how I was going to formulate a recap of the day’s events after what was shaping up to be a sobering 4 set loss to Greenville. I mean, 300 wins for head coach Mary Ann Sprague is cool, but that would sure feel a bit muted after a loss like this. A Devon Marunde serve broke my train of thought and snapped me back into the game at hand just in time to watch Principia neatly tidy up a Greenville swing and return fire with one of their own. On that very same point, with Principia now down 19-14, a thunderous kill courtesy of Sophia Hathaway would begin a defining comeback that encapsulated September 30th, 2017 and cemented its status as one of the greatest days in Principia volleyball history. Over the week between that conversation and the actual games, I crunched numbers and discovered that yes, Mary Ann would be in line for her 300th win on Saturday morning against Iowa Wesleyan in the first game of a double header that would culminate against defending conference champions, Greenville. Now, with a potential win over the SLIAC’s other Panthers would give coach Sprague her 301st win, joining Lee Suarez as the winningest coach in Principia Athletics history. For whatever reason, while 300 wins seemed like a formality, that 301st and record setting win was the big number that I had in mind when officially putting together my plans to travel up to Eureka for the magic day. From the second I walked into the Red Devils’ gym on Saturday morning, I could feel a palpable sense of importance in the air. Something special was set to happen today, but that wan’t meant for just anyone. Today was meant to be Prin’s day, and nothing was going to be able to take that away. Game 1 was never in doubt. From the opening serve of the game that sliced its way between two Tiger defenders for a first point ace, Principia set the tone of the day and announced that win #300 for their beloved head coach would not be denied. Sophia Hathaway convened the matchup with 7 straight serving points, highlighted by 3 aces, while Emily Tippetts further christened things with a game high 13 kills before Cha Cha Fisher adjourned with a game-ending and 300th win clinching kill. With the entire team possessing the knowledge that coach Sprague was sitting on 299 wins, it just wasn’t possible that they would let a victory over conference bottom feeders Iowa Wesleyan slip away. 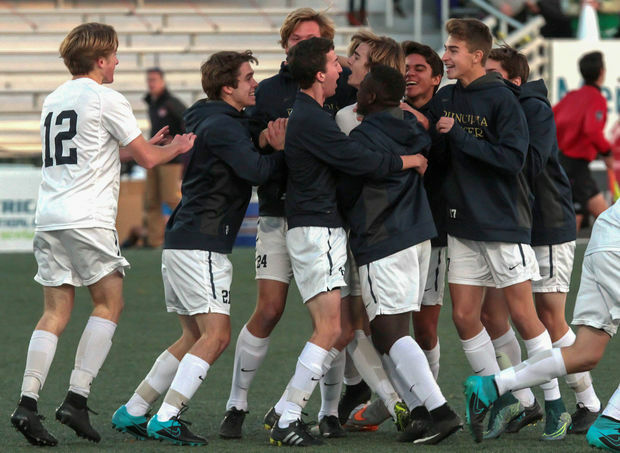 “We wanted the ‘W’ either way” said Hathaway after the game, “but knowing that made us want to play even harder.” For a team that, after that historic win, sat at 14-2, playing “even harder” than a normal effort level should be a scary thought for any other team in the conference. But, for as special as the first game was and for as much history as it made, the main event of the day was still yet to come. Yeah, it was a cool win, but it sure wouldn’t have felt as cool if Greenville had come through and stomped out the fire in Principia’s second game of the day. 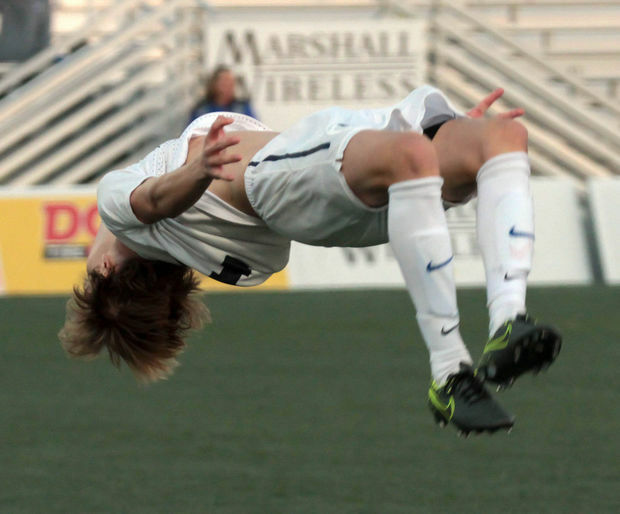 And, in game 1, stomp out the fire was exactly what Greenville did. The orange and black Panthers came out swinging, piling up 17 first set kills, (compared to only 9 for the blue and gold Panthers), en route to a 25-19 victory, doing part 1 of 3 to dampen the Principia mood, still high after that first win of the day. “To be honest, I think [the first win] made us a little cocky in terms of how our attitude shifted from game 1 to game 2” said Hathaway when asked about the slow start against Greenville. Set 2 flipped the script. 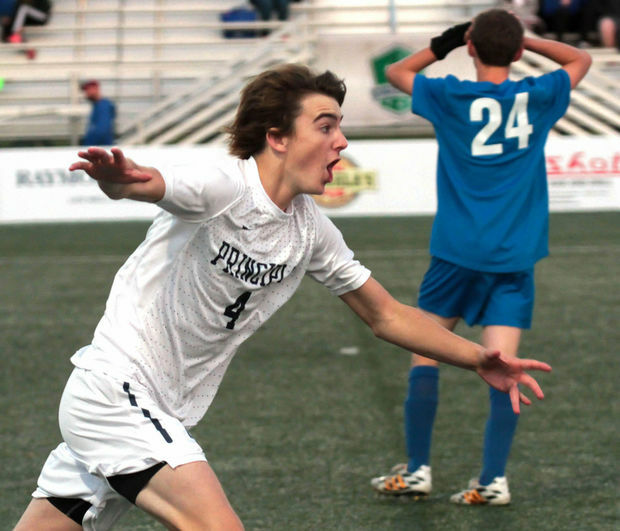 One of the biggest keys to Principia’s game all season long has been hitting efficiency. The blue and gold Panthers have only lost one set this season when swinging above a .200 hitting percentage and a second set tally of 12 kills and 0 errors soared past that magic number to register a .343 hitting percentage. Suddenly, after that 25-14 second set win, a would be blowout now felt like an evenly matched dogfight. Winning a set by 11 points over the defending conference champions is helpful within the canon of trying to win a volleyball game, but the second set awoke something inside Principia that they hadn’t had in the first set. From the second set onward, Principia began showcasing the game that has brought them such early season success so far; phenomenal defensive positioning and digs, scrappiness, scrambling, clever and calculated attacks and reliable serve receiving. However, after Greenville comfortably won the 3rd set 25-16, the magic appeared to have run out and reality appeared to be setting in. A tired group of Panthers struggled their way through the early stages of the 4th set and suddenly found themselves down 19-13, with hands on knees, desperately in need of a side out against Allyson Mitchell. In any sport at any level, truly special teams always have signature wins. Whether that be a big upset victory, a significant comeback or a hard fought overtime win doesn’t particularly matter. As Devon Marunde went back to the serving line with her team down 19-14, I sure wasn’t thinking about how this could potentially be one of those signature wins for a Principia team that, thus far, had won a bunch of games, yet none that I truly considered to be any more special than all the others. An angry Sophia Hathaway slashed three straight kills right into the heart of the Greenville defense and suddenly it was 19-17. Was this really happening? Was this really the same team that had just had hands on knees, looking defeated and downtrodden while searching for any semblance of offense they could find? As I kept asking questions, Principia kept providing answers and the score kept getting closer. 19-18, 19-19, 20-19; this was really happening and I couldn’t believe it. Devon Marunde had served the blue and gold Panthers all the way back into this game and suddenly Greenville were the ones metaphorically wobbling on the ropes. Unsurprisingly, the orange and black Panthers weren’t even close to done, quickly ending Marunde’s magical serving run at 6 straight points, but not before Principia had improbably taken the lead. After trading points back and forth until the score was tied 23-23, Sophia Hathaway stepped back and served out the set, giving the blue and gold Panthers a frantic and miraculous 4th set victory, tying the game up at 2 sets apiece. Principia came out firing in the 5th set in an attempt to minimize the drama and make good on Sophia Hathaway’s between-set feeling. 5-1, 8-2, 8-5, 10-8, the score went up and down and did its best to mimic the pulse of my thumping heart while watching the most exciting live sporting event I’ve seen in quite some time. Much like they’d done all game, the blue and gold Panthers stepped up when it mattered and pulled ahead in the closing points, ending the deciding 5th set on a 5-1 run to seal up a scintillating 5 set win over the defending conference champions. Signature win does not even begin to describe it. Against a Greenville team that Principia has not beaten since 2008 (yeah, 2008) the blue and gold Panthers were able to buck a seemingly automatic historical trend and squeak out the most crucial win of the season thus far. Having lost their last 20 games against Greenville, it would have been easy to understand an apprehension or timidness from Principia entering the game. However, as junior libero Mia Gill pointed out, having the confidence to know that they were just as good a Panther team as their mascot counterparts made all the difference in such a tight matchup. And therein lies the biggest takeaway from such a historic and momentous day. Above all else, this team loves each other, and that means everything in what has been the best start in the history of Principia volleyball through 18 games. Of the 9 players that I interviewed immediately after the Greenville victory on Saturday, all 9 mentioned, at some point, their love for team and teammates and how much that has helped the team come together and play so darn well thus far. With Saturday’s signature win, (yes, I officially have given it the ‘signature win’ label), the ‘vibe tribe’ has now announced themselves as a serious player in the SLIAC. This is no longer a cute story of a happy little Principia team having some early season success, this is a tightly knit, scrappy group of young women who are playing beyond any and all expectations except their own. 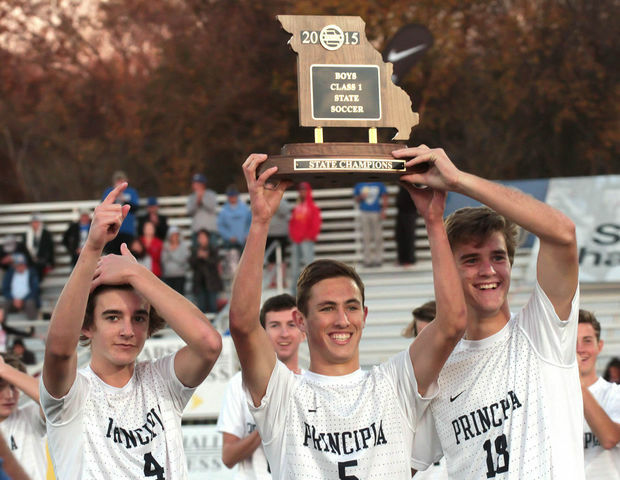 On a day of destiny, in which a legendary head coach was set to enter the history books, Principia not only set the expected history, but continued to write their own history book. Here’s hoping that September 30th, 2017 was merely an opening chapter.